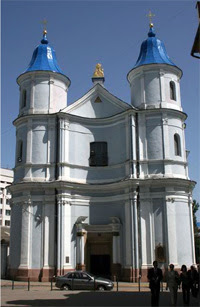 Armenian Church or Armenian Church of the Immaculate Conception of the Most Holy Virgin Mary (folk name – blue church) is an architectural monument of Ivano-Frankivsk. Nowadays it is Pokrovsky cathedral of the Ukrainian Autocephalous Orthodox Church. When the Armenians arrived in the town in the 60-s of the 17th century, they built a wood church. A striking occurrence happened at the beginning of the 18th century. There was a beautiful icon of the Virgin. One day tears started running from her eyes. A divine service began on the same day and it lasted for 44 hours. There were many people at the service. Later on the icon became famous for numerous miraculous healings and it was considered to be miraculous. A cult of the icon was approved by the decree of Pope Pius VI in 1777. The copy of this icon is at the gable of the church. The original was brought to Poland in 1944 and now it is in the Saint Peter and Paul Cathedral in Gdansk. In honor of the appearance of the miracle-working icon a majestic church was built during the next 20 years. It was built on the initiative of Armenian community in Stanislaviv. This church is an example of late baroque by its spacious form. In 1868 the building was badly damaged during the conflagration. It was reconstructed and nowadays the church’s shape proves the high skills of the creators. The church is decorated with vivid sculpture pieces inside. A gallery of 14 big columns with figures and beautiful frescos on the walls painted by Yan Soletskyi attract attention of the visitors. There are also sculptures of Saint Nicolas and Saint Onuphriy made by famous Matiy Poleyovskyi. All the sculpture pieces are polychromic, carved of wood, painted and gilded. Wall- paintings correspond to the biblical subjects. Altar slab (Khachkar) made in Armenian style also draws visitors’ attention. It lies in the middle of the altar. Its designer is Italian architect Trelli who had his own workshop in Stanislaviv. During the years of dominance of the communist atheism the church was closed. The Museum of History, Religion and Atheism was opened in 1970 in church’s building. The church has belonged to UAOC (the Ukrainian Autocephalous (autonomous) Orthodox Church) since 1990.